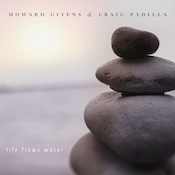 While the title Life Flows Water suggests something earthy and organic, the music on this collaboration between Howard Givens and Craig Padilla embraces the kind of broad, sweeping vistas and tonal elements of classic spacemusic. Whether you view the voyage as inner or outer, it’s going to be a fantastic ride. Bookended by chimes that mark it as a meditation, Life Flows Water immediately settles into that role. It is quiet and soft throughout, the calming flows perfectly ripped in places by slow-moving sequencer lines and gentle melodies. It’s the latter in “A Step Achieved,” where liquid pads swirl under a charmingly simple song. The notes of the melody are high and bright, popping up like bursts of color. The sequencer works beautifully into tracks such as “Awakened Consciousness” and “Tide of Opposition.” This is where it hits that spacemusic stride and pings certain nostalgia centers. It’s got the familiar energy and tone of classic electronic music and it makes for a nice change in the flow of things. “Tide…” is perhaps my favorite track here as it calls to mind my favorite Berlin-school artists, from T-Dream to Ministry of Inside Things, with precise lines cutting angles into the air and filling the space with a flute-like synth line. The intricacies of the sequencer work are what particularly catch my ear here. The rhythm gets me swaying and the whole piece reminds me what made me love this music in the first place. When you listen to Life Flows Water, expect to get lost in it. Givens and Padilla revel in the softness of the sound here, and the consistently sighing pads that course beneath everything are utterly soothing. Headphones are a must for this; you want to get as close to the sound as possible and let it wrap around you. A beautiful work, perfect for your end-of-day listening.